Ocean breezes. Tropical islands. All accessible by bicycle or on foot along the Florida Keys Overseas Heritage Trail, a 109-mile bike route from Key West to Key Largo. This book is a mile-by-mile guide for you to explore the Florida Keys under your own power while following the Overseas Heritage Trail across dozens of historic railroad bridges and past lengthy ocean panoramas that only the Florida Keys can offer. Going by bike or by foot means taking the Florida Keys at a leisurely pace, savoring the journey, and discovering natural places and historic sites that visitors in cars simply whiz right past without realizing what they’re missing. It also means that the trail slips back into history and nature along Old US 1 on some of the islands, taking you away from the highway to offer up views of mangrove marshes, salt flats, and wide open turquoise waters. On a bicycle, you can more easily take advantage of the side trips we mention throughout the guide, to better enjoy the “off the beaten path” corners of the Florida Keys. Throughout the guide, we provide details as to when you do and don’t have a bike path to follow, information on campgrounds and inexpensive lodgings along the route, and recommendations for more luxurious stays at resorts and hotels. We share our favorites among the many eateries in the Keys as well. You’ll learn about parks and natural areas along the route, and a little history about the Overseas Railroad, which shut down in 1935. The trail mostly follows its route. This is a trail guide, and a travel guide. 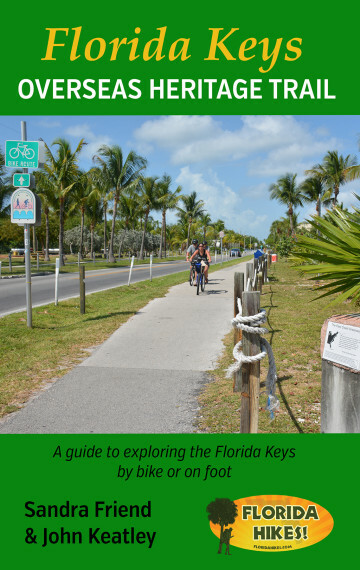 In addition to the mile-by-mile descriptions of every waypoint of interest along the Overseas Heritage Trail – matched to trail mileage, not highway mileage – you’ll find out how to connect to the mainland by bicycle or on foot, how to get you and your bicycle to Key West from the Miami airport, and where the bike shops are along the route. We list bike shops and outfitters who rent bicycles for the ride, as well.